Look At This nova scotia power hook up online dating first meeting coffee have a peek here Recommended Reading why not check here rencontre seniors gratuite paca are rob dyrdek and chanel dudley dating hipnosis para ligar mujeres partnersuche nordfriesland Flashback: I’m 12. I’ve gone home with my friend Catie after school. Catie’s mom makes us an after school snack. 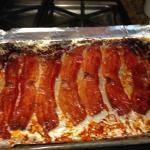 She coats some little squares of raw bacon in brown sugar and pops it in the toaster oven for a few minutes. That’s it. 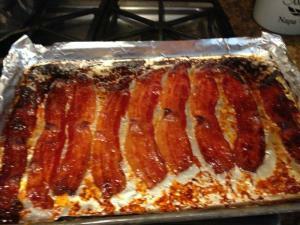 And wow – yummy crispy sweet candied bacon. My thoughts at the time? Catie’s mom is cool. Another thought at the time: my mom always makes us eat fruit after school – Not cool. 20 or so years pass: I go to a happening new restaurant in Hollywood which has since gone under. Instead of nuts and pretzels in little bowls on the bar they have something called pig candy. It is immediately reminiscent of Catie’s moms snack, except is has a little kick… Cayenne pepper! Many more years pass: a food truck around the corner from my house with the BEST burgers puts Catie’s mom’s bacon on their signature burger along with several other delightful toppings which include avocado and garlic chipotle aioli. It is time to share this one with the world- bacon candy (or CMB as we call it sometimes, which stands for Catie’s Mom’s Bacon, of course) is easy, crazy-delicious, and versatile. You could even sprinkle it on top of some homemade chocolate covered toffee (I will share a crispy toffee recipe I love later this month) while the chocolate is still melt-y and soft. Give it a try! Preheat oven to 350. 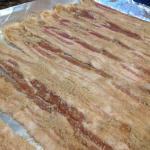 Coat bacon slices on both sides with the sugar. Place on a foil lined cookie sheet that has been sprayed with canola or vegetable oil. Or you can cook on rack set inside a cookie sheet. Spray the rack first with canola or vegetable oil. 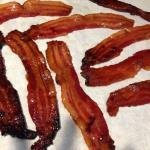 Cook 15-30 minutes until your bacon looks cooked or a little crispy (your preference). 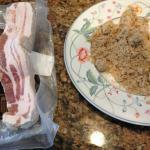 Move cooked bacon from the cookie sheet to a piece of parchment paper to cool. It will be sticky! Try to resist eating it all in one sitting. Use it as a snack, dessert (topping for cheesecake, ice cream, toffee)’ burger topping, etc. Apparently your mom is a total trend setter!